Alfred Pennyworth: Some men simply want to watch the world burn. There can only be one Batman and as I sat amongst a full crowd that was silent in awed anticipation at the crack of the film, it is clear that director, Christopher Nolan’s Batman is the one. In BATMAN BEGINS, Nolan (whom at the time he attempted to revive the franchise, had only directed a handful of indie projects) took an icon and made him human. Batman, and of course his real life persona, Bruce Wayne, was damaged. He had fears; he had frustrations; he had to find himself. What he found with a little push from Nolan was a flawed figure but also a man whose heroism was defined by his humility and relentless pursuit of justice for those incapable of demanding it for themselves. With the arrival of THE DARK KNIGHT, Nolan has finished with his foundation and taken to the vertigo-inducing heights on the tallest of Gotham’s buildings to analyze the city and all its inhabitants. 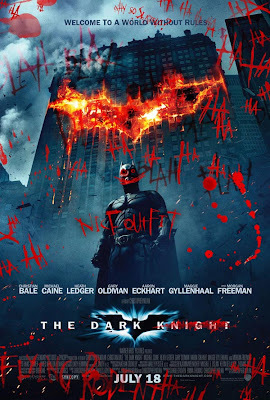 Gliding both gracefully and dauntingly through all of it is the dark knight himself (reprised by third time Nolan collaborator, Christian Bale). What he sees from his unique view that becomes our privileged spectacle is a world of delineating lines and order that is about to be torn apart by chaos and chance. Gotham City must be pretty far down the list of safest places in America to live. Not only does there seem to be nightly violence at the hands of common street thugs, but all the crazies seem to end setting up shop there too. Enter the Joker (Heath Ledger). We know nothing of what made him the homicidal maniac he is or why he has no regard for human life. In fact, he has nothing but disdain for it. Humanity’s rules and order may disgust him but they also make it possible for him to predict how people will behave, allowing him the chance to throw out loops to throw them off and laugh at their expense. The Joker is frightening enough in concept but Ledger’s performance is down right terrifying. As he constantly licks his lips with self-assured cynicism, he cuts to the chase in every scenario. He has no time for any games, other than the ones he orchestrates himself, and commands control everywhere he goes. His idea of playing always involves games with the ultimate consequence and the highest of stakes. In order to win these games, you must reject what you know and become everything you denounce. Only winners will know the rewards of living both sides of the coin and the Joker is counting on fear to prevail so that he can finally have someone to play with. Along with his brother, Jonathan, Nolan has crafted a dark, twisted dissection of duality and morality that is often shocking, unexpected and intricately detailed. In every superhero tale, everyone always wants to know the man behind the mask. The mask itself, the creation of another persona other than the one that sits safely behind it, initiates the duality that permeates the notion of the superhero figure. Batman is the dark knight. He only comes out at night and no one would suspect the man he is by day might be one and the same. The Joker’s chaos theory ruptures Batman’s controlled existence and forces him to think in a darker fashion than he has ever had to before. Thinking that darkly though can leave you stranded in that space and this is what the Joker is counting on. What makes THE DARK KNIGHT so rich is that almost every character has conflict and questions their actions and motivations. No answer is the clear right answer and deceit seems to play a role in even the most well-intentioned decisions. The greatest irony is that the darkest character actually has the purest of souls while the would be clown seems to have no soul at all. This is perhaps what makes them such worthy adversaries and why they both almost seem to enjoy the challenge. When THE DARK KNIGHT feels like it might be ending, the anxiety mounts because you won’t want it to end. It has an enormous scope but is somehow still subtle. It is incredibly complex but yet still simple. The film itself is steeped in just as much duality as its hero. Nolan never loses control of his dualistic duty – to create a Batman film that pleases both the masses and the fans, that encompasses the grandness of a blockbuster with the darkness of the independent spirit and wows without resorting to cheap tricks. Once again, Nolan has grounded the sensational on very firm footing by never allowing Batman to be anything other than a man. We can then stand on the same level ground as the giant bat and feel a satisfaction that is both real and incredible. How many sheep would you give The Dark Knight? Great review. Very well worded.